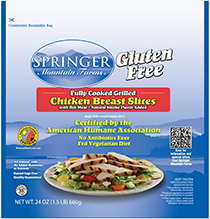 Springer Mountain Farms Fully Cooked, Gluten Free, Grilled Breast Slices are fully cooked and perfect for fajitas, flatbread pizza, salads and more! 1. Place grilled chicken slices in a single layer in a microwave safe dish. 3. Heat on high power until heated thoroughly. 4. Let stand 1 minute before serving. •	Heat one serving (3 oz) 1 ½ - 1 ¾ minutes. •	Heat one package (24 oz) 6 ½ - 7 ¼ minutes; stirring every two minutes. 1. Place grilled chicken slices in a single layer in a large skillet. 3. Cover skillet and heat on medium heat 12 minutes or until heated thoroughly. 4. Stir to separate slices every 3 minutes. *Add additional water if needed during the process.